Robert Spruill (pronounced “Sprool”) used to have the kind of job many of us would envy: He made movies. His first movie, Squeeze, told the tale of three teenage boys trying to fight back against the drugs and violence of the streets. It received critical adulation and was bought by Miramax. In his second film, Body Count, he directed actors like David Caruso, John Leguizamo, Ving Rhames and Forest Whitaker, and for Spruill’s documentary, Do It Again, he filmed interviews with the likes of Paul McCartney and Sting. 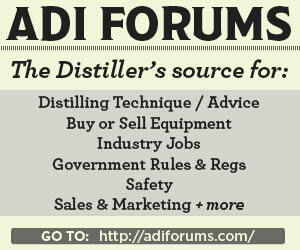 Both entertainment and distilling were family businesses, in a way. Spruill’s father taught acting and directing at Boston University, and a young Robert would often have to sit through the end of his classes awaiting a ride home. At the same time, Robert and his brother, Joshua, would spend much of their summers with their grandparents in North Carolina. Their grandfather, Robert Patton (Spruill’s namesake), and his brother, Clifford, (“mountain colored folks,” as he puts it) owned a juke joint called the Ebony Lounge—and they distilled their own spirits. Robert and Joshua started learning the basics of distillation before they were old enough to drive. Fast-forward some 30 years. Spruill’s mother died, and he suddenly felt the weight of his own mortality. “I asked myself if I’d done everything I wanted to do in life,” he said. Obviously, he hadn’t. 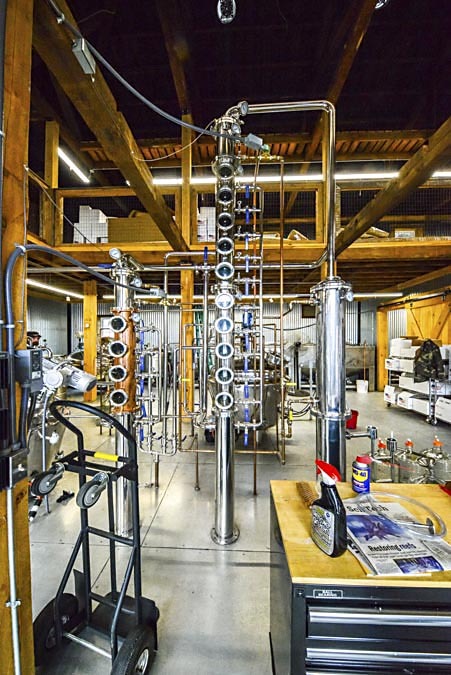 They currently have two 100-gallon stripping stills and one 50-gallon still and an annual production between 5,000–6,000 gallons. The rest of the small team consists of Spruill’s wife, Patti Moreno; their daughter, Alejandra (Al, for short); his brother, Joshua; their “mash man,” Ben Kilanski and “my bottling expert,” Dennis Murphy (“Murph,” around the shop). Three years in, they are also selling whiskey, bourbon and single malt as well as several rums and moonshines, and Spruill’s story is becoming part of the larger stories of the growth of craft spirits and the renewal of America’s cities. 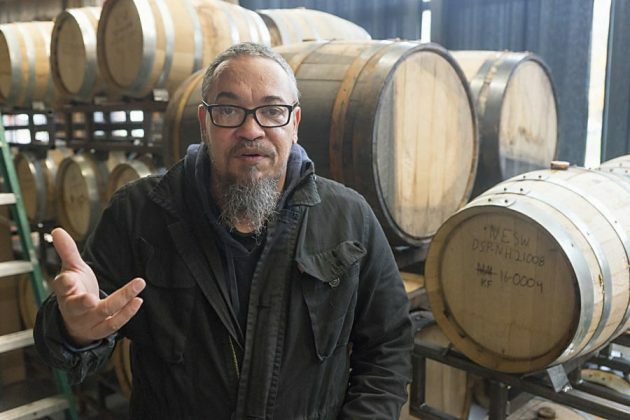 Spruill, of course, began distilling out of passion, and the craft of distilling remains central to his day-to-day business as well as his vision of the future, and his spirits reflect that. 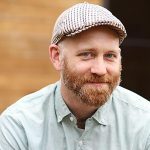 He uses tomato paste in his moonshine—a North Carolina trick he picked up from his grandfather (it turns out the alanine in tomatoes reduces the chance of hangovers). But he strives to put an authentic New England twist on every recipe. He also uses local ingredients and traditional regional techniques when appropriate. Ashuelot Vodka, for instance, is triple-distilled from a mash of locally sourced apples and potatoes. As he told the Boston Globe, his vodka is not fully pure “because I hate vodka or neutral spirits that don’t give you a hint of where they come from.” The vodka forms the base for his Ashuelot Gin, a “New England rainy day” recipe featuring coriander seed, lemon peel and angelica and orris roots. Spruill had an experience that turned him off of gin and hadn’t planned to make any, but he created Ashuelot Gin when his wife insisted he had to: “Challenge yourself and make a gin you like as a non-gin drinker,” she said. Then there is his Kingfish Gold Rum. It is distilled in the New England style from American blackstrap molasses rather than sugar. Spruill also reverse-engineered early colonial distilling techniques. “I thought, ‘How the hell did they control the temperature with a wood-fire still?’ The answer, of course, is that they didn’t.” His solution involved distilling at a high heat but ending the cycle early, which left some of the molasses coating the interior of the still. When he sent the spirits back through, they developed a smoky quality he decided he liked. Sweetwater has become part of downtown Winchester’s recent renewal. The original plan had been to build the distillery on his mother’s farm outside Winchester, NH, and for the farm to provide all the ingredients for the distillery. 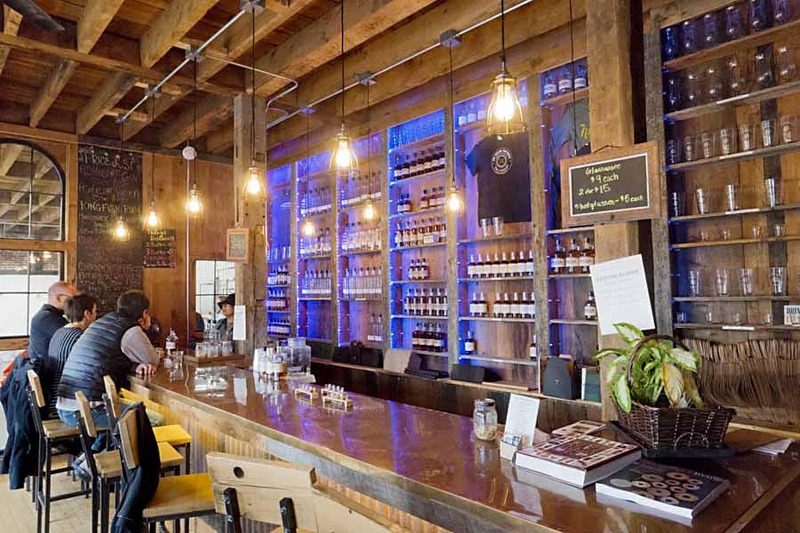 It turned out Spruill could avoid some hassle and expense from licensing bodies by setting up in town, so he bought an old hardware store right on Main Street and fixed it up into a distillery and tasting room. It proved to be the right move for several reasons. To begin with, you cannot beat the location—right in the heart of town. And the building is beautiful inside and out. It’s a historic red-brick structure with arched windows along the second story. If you search Google images for “Winchester, NH,” the first hit will be an old postcard from 1909 featuring the same building (a general store at the time) and the old post office next door (also still standing, also owned by Spruill, who plans to make it a winery). Inside you are surrounded by elegant, reclaimed hardwoods lit by warm Edison bulbs hanging from the ceiling. The bar, a sheet of copper supported by the charred roof beams of an old barn, shines like a mirror and reflects back the subtle hues of the spirits lined along it. Behind that are towering shelves of bourbon, whiskey, vodka and gin. If all that wasn’t perfect enough, the Ashuelot River runs right behind their building, creating an energy both dynamic and pacific. On the farm, Spruill and his wife grow grapes, blueberries, cider apples and juniper berries as well as raise pigs and chickens on the 50-acre property. At one time, Spruill and Moreno imagined growing their own grain and becoming self-sufficient, but they have since realized that the climate and the rolling hills are better suited to raising livestock than to growing grain. They’ve adapted their plans accordingly. In fact, they purchased the building next door to the distillery and are planning to turn it into a barbecue and brewhouse. They will grow what they can on their farm, source what they can locally and continue to work with their Midwest grain producers. 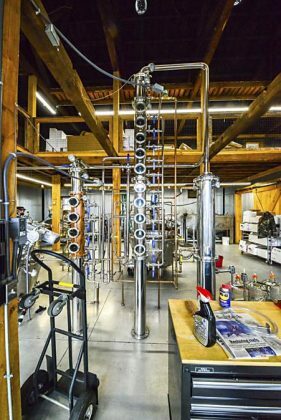 When news first broke about their new distillery, some Winchester folks voiced concerns about what it would do to their town. Now, however, Spruill gets the idea that people would love him to scale up and become a Jim Beam or Maker’s Mark, an industrial-sized operation that could replace some of the region’s former industries. After all, it’s all about the craft for him; he could be making movies for a big production company. Maybe that’s what he learned from doing that Kinks documentary, hearing Ray Davies singing, “You and me, we’re free. We do as we please… till the end of the day.” Robert Spruill is doing as he pleases, and New England is pretty happy about it, too. 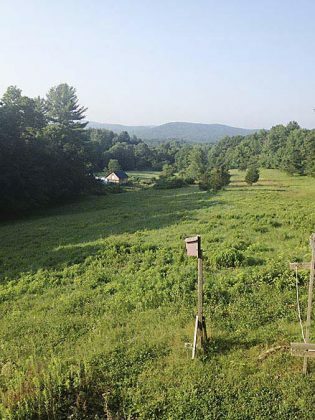 Sweetwater Farm, Winchester, NH. Photo courtesty of New England Sweetwater Farm Distillery.